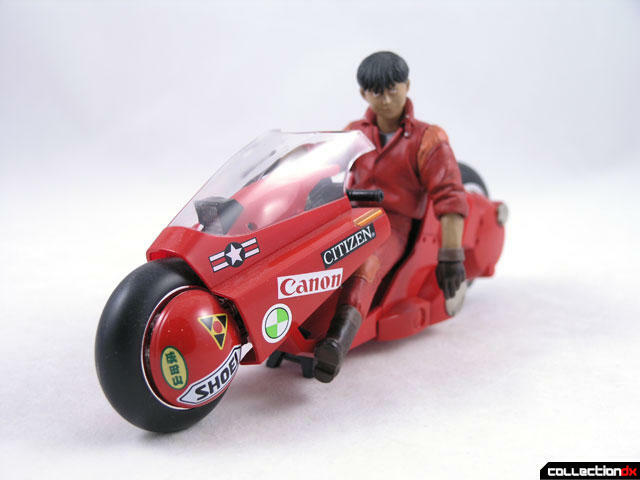 Everyone loves Kaneda’s bike. It has become a symbol to anime fans across the world. I remember watching AKIRA for the first time. I just picked up a bootleg vhs tape of the raw movie at a comic convention after seeing it on the screen at a dealers booth. I ran home to watch it, only to find that all of my VCRs were broken. I quickly called a few friends to see if I could bring it over and watch it. I ended up going over this kid Scott’s house to watch it – he could care less about it. I remember watching that scene where all the buildings explode with the riot going on… I couldn’t understand what they were saying, but right then and there my mind was opened to a whole new world. 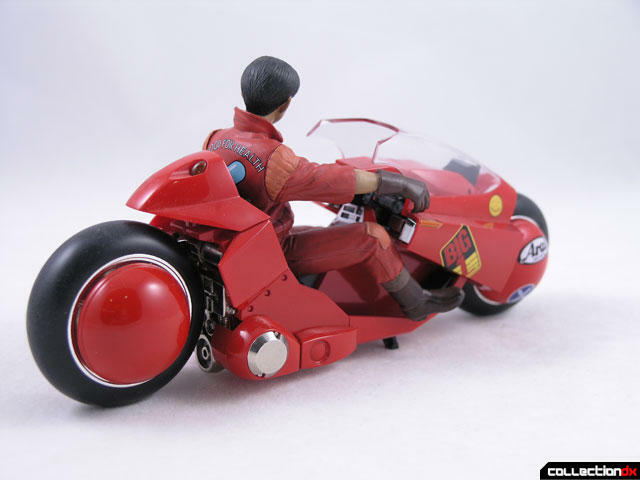 Kaneda’s bike in AKIRA is just awesome. Street punk Kaneda steals the bike and uses it to fight against the clown gang. This bike is smoking hot. To this day people are still trying to make a working version of it. I think it is every otaku’s dream to sit behind the wheel of this thing and cruise around Neo Tokyo. 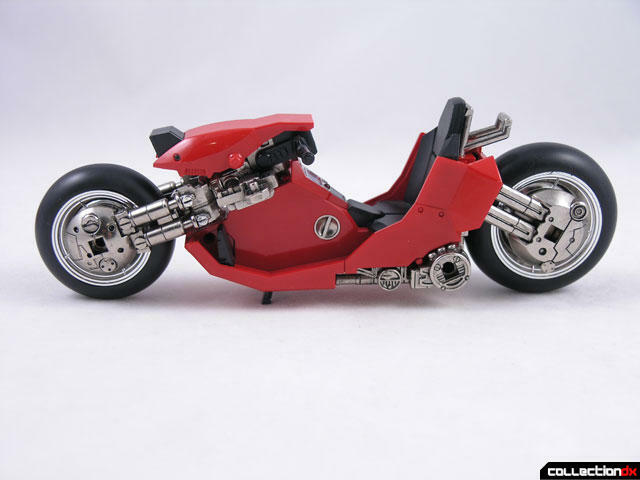 There have been a few attempts at making a nice toy of the bike, but none come anywhere as close as the PX-03 Soul of Popynica Kaneda’s Bike. 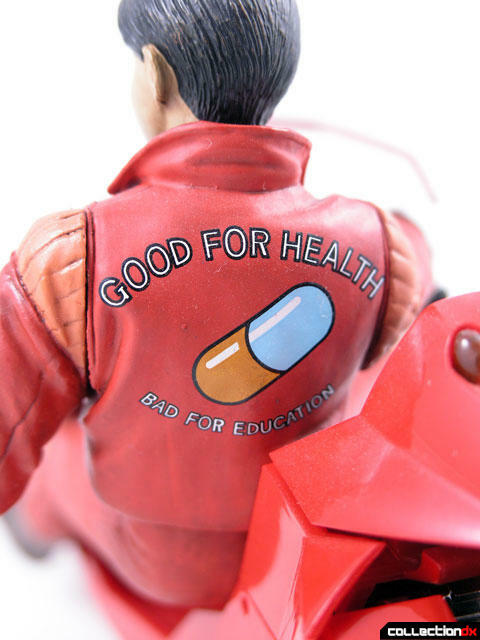 This is an amazing piece, and if you are a fan of Akira, there’s no reason for you not to have it. 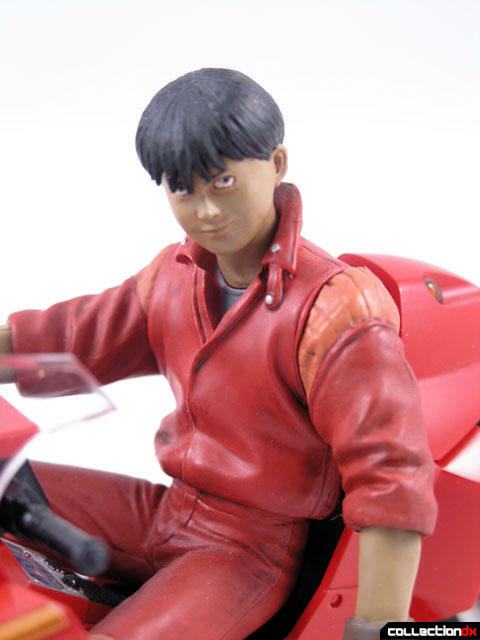 First of all, the bike comes with a Kaneda figure that is basically stuck in the pose you see him in. Boo to Bandai for not making him articulated. Still, he looks nice and fits well on the bike. 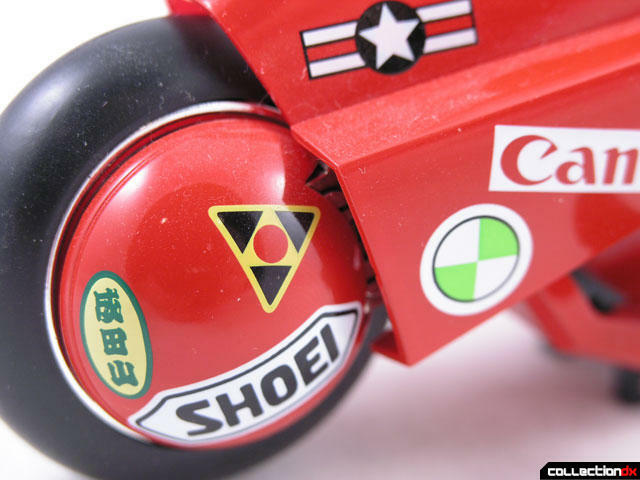 The markings on Kaneda’s bike are anime accurate – something the McFarlane version wasn’t able to do. 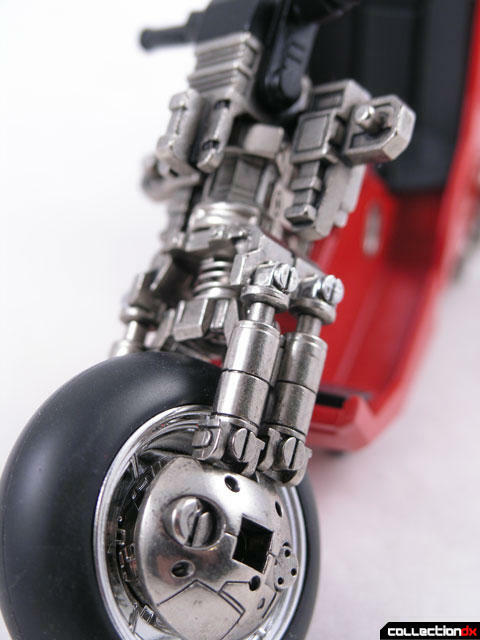 The toy features rubber tires, clear windscreen, and diecast internal skeleton. 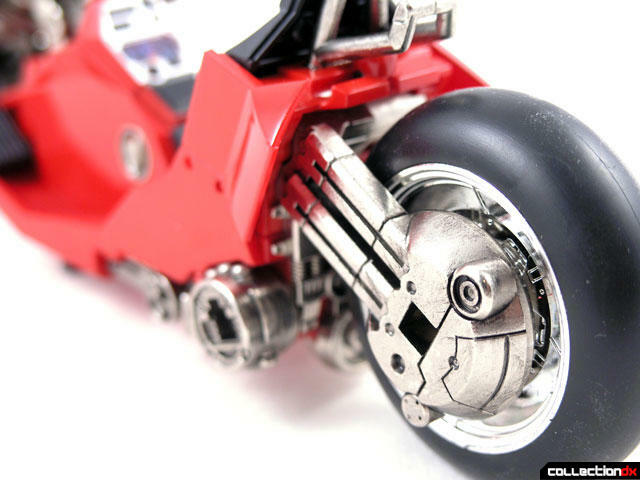 Most of the parts on Kaneda’s bike can be removed to expose the beautiful diecast beneath. Pretty much anything you see silver is metal. The front fork turns, raises and lowers, and has spring loaded suspension. 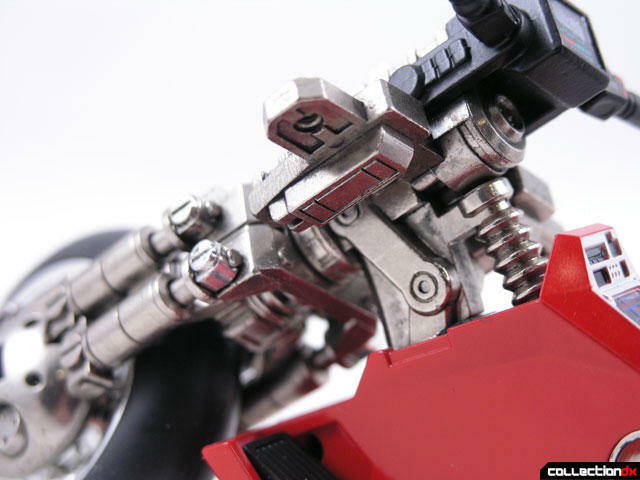 Kaneda’s bike comes with a second set of coverings that can separate a little differently than the first set. 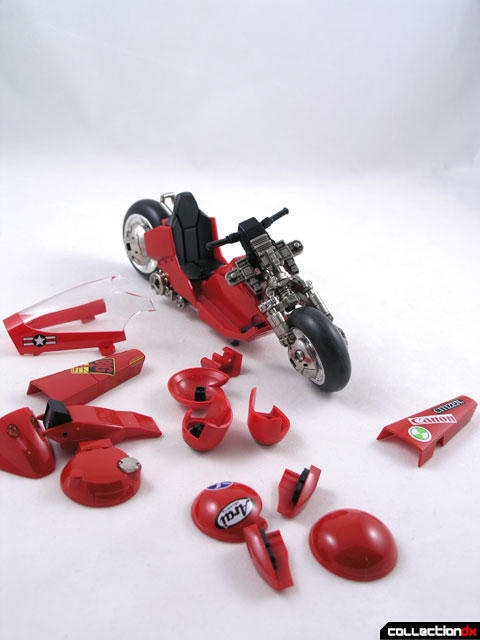 This toy was first unveiled at the Tokyo Motorcycle Show with a limited edition “naked” version – this was basically just the bike without any of the sponsor logos printed on it. 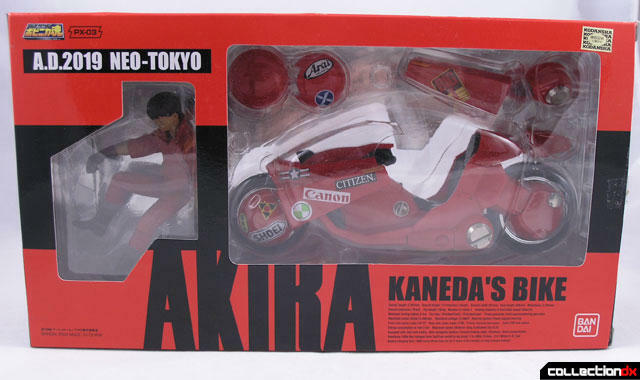 Also, the Kaneda figure was not included with this version. I’m not kidding – this thing rocks and you need to get it. They are reasonably cheap, all things considered. Here is the amazing Bike scene from Akira in all its glory.